Wonderful students from Dundee Elementary! "Lori presented a two day workshop for our school in early September. She instructed our older students in the craft of writing and shared her stories with our younger ones. Our entire student body fell in love with her. We laughed because our kindergarteners called her "Mrs. Pickles" and they still ask about her now three months later. She had a positive impact on our students with her gentle, caring and loving way. During lunch recess, Lori went outside and played with the children. They have adopted Lori as "their friend" who just happens to write books. She made everyone believe that they, too, could be a writer. And, isn't that what it's all about? I would highly recommend Lori as a guest author for any school without reservation." 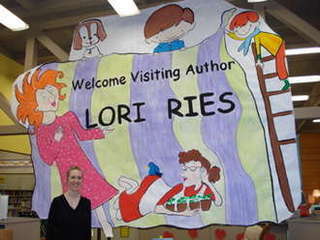 " With her playful spirit and charming stories and her way with kids Lori is a wonderful ambassador for children's literature." "The kids were enthralled with the presentation, and were drawn by Lori to interact with the writing process discussion, and to ask questions." "Such a delight to have you come in and share the life of a writer. What a joy." It's always a delight to meet young writers! What do you do for a school visit? 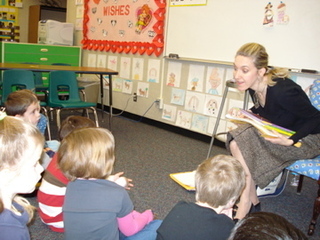 School visits are generally two-day visits. I visit the school for two full days, and work with the school's schedule for class arrangements. For K-1st grades, Attention spans are generally shorter. We read stories, playing with characters and with an emphasis on "imagination." Grades 2-3, are able to maintain a longer focus, so I've crafted a presentation for this age called "Cooking up a Story" where we get into Character, Setting, and Plot. For grades 4th-5th we do a full on writing workshop called "Story Building" where kids learn how to create strong characters, they'll make up their own delicious settings using sensory writing, and learn about the conflict and tension needed for strong story. Volunteers share aloud with classmates, and it's a fun hour. With all classes I show them how books are made, and we talk about the books and characters they love in their personal reading. If you're interested in an author visit, I do work with teacher schedules and content. I can tailor a presentation to meet your specific needs. I do have a pre-visit packet I send out to the school ahead with book order information, Book Bites, (ways to use books in the classroom) and illustrator line drawings, which are way fun for kids. This is sometimes expanded to include a Mrs. Fickle activity, either planting a small seed, or making a pickle ornament to hang on a Christmas tree, as is (said) to be a German tradition. Teachers have supplies on hand, and I am there to assist. Please let me know if you plan to include an activity. Presentations for grades 2-4 run about 35-45 minutes. Grades 5 and 6 presentations last about 60-70 minutes. Students will need a flat surface for writing. Actual tables where students can sit, and work together, work best as we do group exercises to learn about the writing process. 2-6 Gym or library setting, screen, table for laptop and projector, microphone if needed. Please prepare for the author visit by getting children acquainted with the books. This way when I come to your school, the students will be excited to see into the world of publishing and how these particular books were created. Creating great books takes a great team! Check out "Reading Seeds" for an eleven page unit of fun, creative ways to use Ben and Aggie in the classroom! One of the greatest joys for children's authors is the opportunity to connect with students. Please remind your students about internet safety and sharing personal information online when they comment on author sites. There are times when students share too much personal information as with full names and addresses or school information. Author websites are widely public, and students can forget this. We love fan mail, but also wish to keep our reader friends personal information protected. Thank you for teaching our readers about online safety.